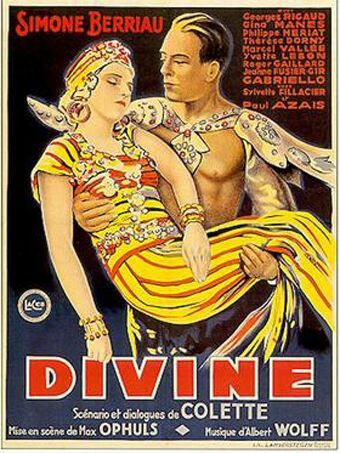 “According to the opening credits, Divine, directed by Max Ophūls, is the “first screenplay written specifically for the cinema with dialogue by … Colette [of the sound era],” The film is based on one of her literary works. 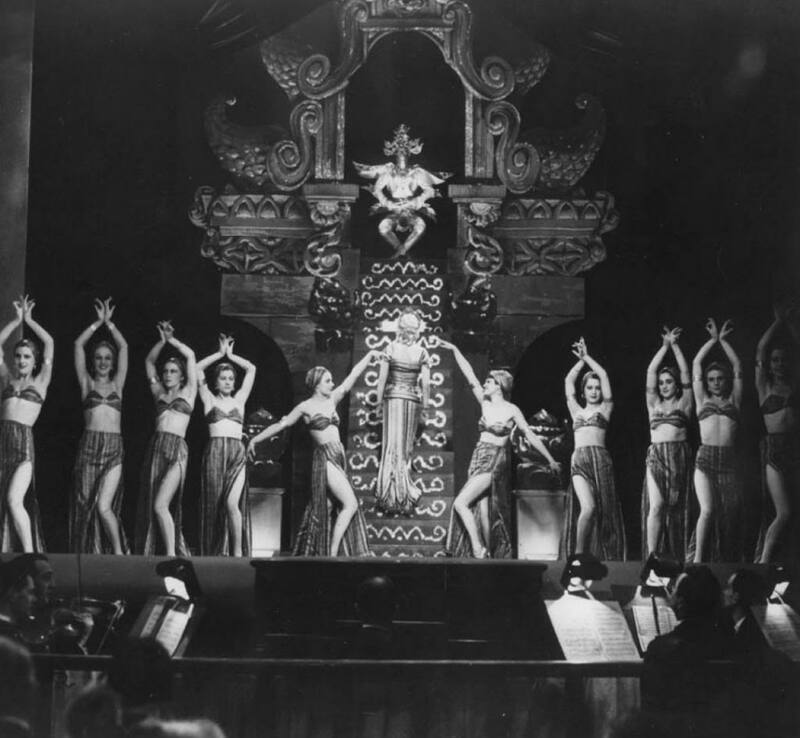 ‘L’Envers du music-hall’ (1913), a moving choral fresco about the music hall comprised of sequences detailing numerous individual stories provides the frame. The novella ‘Divine’ supplied the film with its protagonist who has the body of both a Goddess and a peasant and who is played by Simone Barriau [as Ludivine ‘Divine’ Jaris] (who also acted as producer and who made her country estate available for the exteriors).” (Paolo Palme). The film opens in the country [on this estate] where young Ludivine is persuaded to move to Paris and work in the music hall by her friend Roberte (Yvette Lebon). Once working at the Paris music-hall in the chorus Ludivine is soon christened ‘Divine’. She starts to ascent the stairway to stardom: an early lead role involves her being draped with a live snake in a exotic and orientalist number. ‘Divine’ is the centre of the narrative. We see her pursued and fending off the various offensives by male admirers. She also acquires a non- music hall boyfriend, the local milkman, Antonin (Georges Rigaud).. With him she shares the love of the rural world from which she comes. Other stories are also followed, including the use of drugs by the performers. Much of the film displays with great detail and a sense of the authentic, the world of the backstage, with which both Colette and Ophüls were familiar. Whilst the theatrical world and the characters are very much Colette the presentation is very much Ophüls. As a filmmaker he was noted for the mobility of the camerawork and the smooth but complex style of editing. By this stage of his career Ophüls had already directed Liebelei (1933 in Germany) and La Signora Di Tutti (1934 in Italy). Both display the skills that grace his cinema, they also reflect the peripatetic nature of his filmmaking life. In this French film he is ably served by the craftsmen: set design by Jacques Gotko and Robert Gys, cinematography by Roger Hubert, editing by Léonide Moguy. The distinctive and effective style of the film is demonstrated in the opening sequence where Roberte comes to visit her childhood friend in her expensive motor car. Ludivine is helping her mother (Catherine Fonteney) plough a field on their farm. The trio of women return to the farmhouse where, over the evening, Roberte explains to Ludivine the attractions of music hall stardom. [The following is from my notes at the screening so I may have not noted all the shots]. Opening on a close up of a plough, a mid-shot shows the two women with the plough and the farm horse. A dissolve leads to close ups of the plough, a wheel, a mirror and then a mid-shot of the motor car to which they belong. A track follows a young blonde woman (Roberte) as she runs to greet mother and daughter. A further reverse track shows the three women, with the horse, returning to the farmhouse. A dissolve shows us the interior and soup on the stove. A reverse track fills out the room and the family dog. A skilful pan shows Roberte with Ludivine as they remove their wet stockings. There is a cut to a long shot of the room and the women framed through the old fashioned fire place. Another dissolve takes us to Ludivine’s bedroom where the girls change in shadows. A dolly follows as both girls sit together on the bed. A pan follows Roberte as she demonstrates a theatrical walk moving from the bed to the window. A further pan moves us back to Ludivine as he then copies Roberte’s walk. [A tolling bell sounds in the distance]. The camera tilts up the wall to a picture of Angels. A cut moves from Roberte [to the accompaniment of music including drums on the soundtrack) to the exterior of Folie Bergeres. A further cuts takes us backs stage to where a dance troupe is preparing for an act. A combined track and crane shot travels around backstage as we see various theatrical individuals and then climb up towards the back stage dressing rooms. Thus Ludivine arrives in the world of the music hall. There are several equally stylish sequences in the film, mainly set in the back state of the theatre as we see the working lives of the thespians. At one point a complete 360% camera movement presents the whole of the set of one of the revue numbers. And there are a number of beautifully executed track and crane shots. The style embellishes the film beyond its often conventional narrative. All together it makes for a memorable 74 minutes. The original release ran at 82 minutes, but whatever is missing did not seem noticeable. The 35mm print was reasonably good: the film was restored from the original nitrate in 1997. The soundtrack, from the mid-1930s, was tinny at times but pretty good for the period. . This entry was posted on July 19, 2017 at 10:37 am	and is filed under auteurs, French film, Literature on Film. Tagged: 35mm, Il Cinema Ritrovato. You can follow any responses to this entry through the RSS 2.0 feed. You can leave a response, or trackback from your own site.